Lace was among the most highly prized and expensive of all textiles in the 17th century. From the main centres of production in Italy and Flanders it was traded widely across Europe, and the industry responded quickly to changes in fashionable dress, as different styles came in and out of favour. In the 1660s, Venetian needle lace became the most fashionable lace, dominating the upper end of the market for both men’s and women’s dress. The industry also expanded rapidly through the patronage of the Catholic Church. Italian lace-makers exaggerated the three-dimensional qualities of needle lace, and developed the technique of dividing up large patterns into manageable sections, enabling the production of large-scale ecclesiastical items like vestments and church furnishings that were conspicuously extravagant. 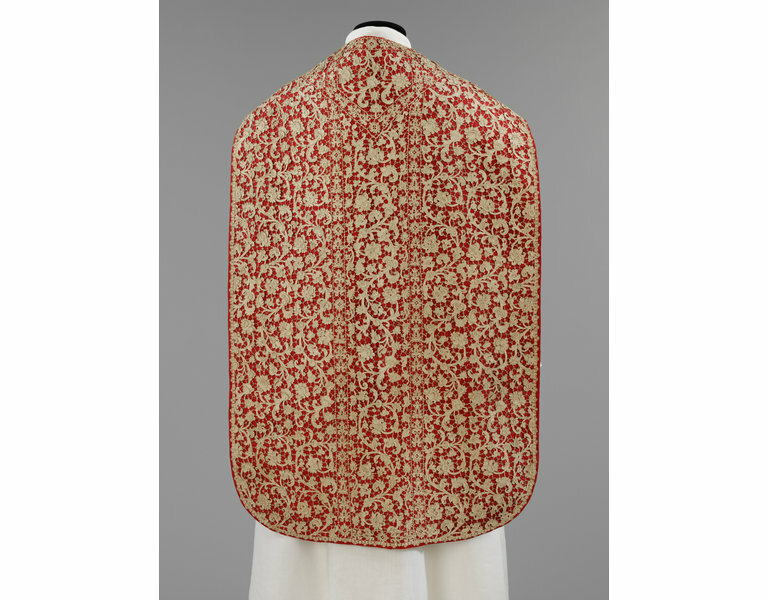 Chasuble of raised needle lace mounted on slightly watered plain woven red silk. The lace is mostly in the typical scrolling floral pattern of Venetian raised needle lace, separated by narrow vertical and horizontal bands with flower heads defiing the construction of the chasuble, particularly around the V shaped neck. 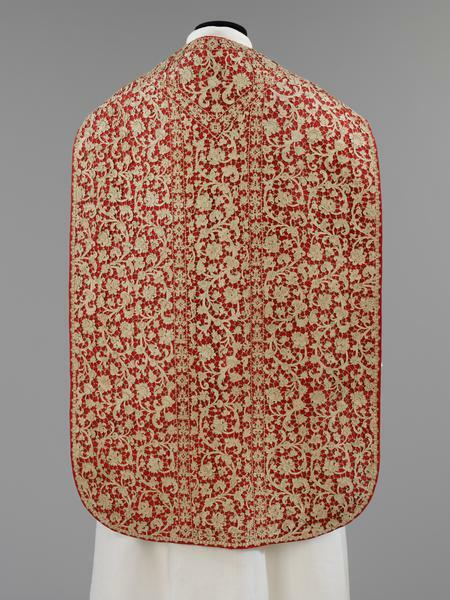 The lace has not been worked to shape for the chasuble, but its design shows symmetrical repeating blocks, whose motifs have been slightly manipulated in places. It is likely that the lace was mounted onto the red silk ground shortly before its purchase by the Museum in 1870, and that the 17th century lace was modified, repaired and augmented slightly then. The narrow outer edging matches that on the other pieces of the set, and is likely to be 19th century. Purchased in 1870 for £100 from lace dealer Arthur Blackborne, 35 South Audley Street, London (described as probably 16th century Spanish). Blackborne was the leading London lace dealer at this time. A letter on file from Sir Matthew Digby Wyatt notes : "I do not think the Department is likely to meet with a more eligible example of the splendour with which such vestments were wrought in the richest days of the Roman Catholic Church." 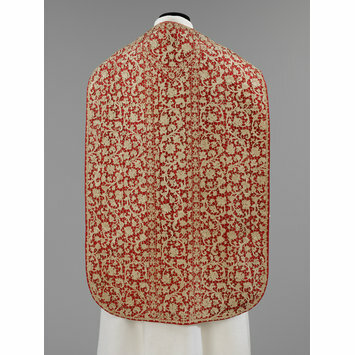 Typically for lace of this date which passed through the very active collectors' lace market in the mid/later 19th century, the chasuble and the other pieces in the set have been tidied up, by realigning and mending some of the motifs and linking bars, as well as being remounted on silk.